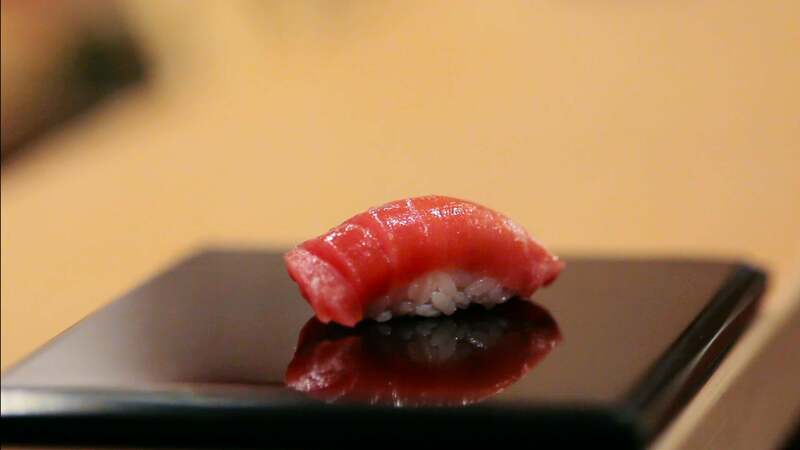 A still from Jiro Dreams of Sushi. At Sukiyabashi Jiro, a meal can run you $363 (or 30,000 yen)—and that’s not to mention the airfare to Tokyo for those of us who don’t live in Japan. So the restaurant may seem a rather precious subject for a documentary—especially when you learn that the film’s director, David Gelb, has little background in either sushi or filmmaking: He’s a 28-year-old American who doesn’t speak Japanese, and Jiro Dreams of Sushi is his first feature film. And yet Jiro Dreams of Sushi, which opens in limited release tonight, is a well-crafted, tantalizing delight. (I’m not the only one who thinks so: The film currently has a 94% rating on Rotten Tomatoes.) Yes, there are many gorgeous shots of chef Jiro Ono’s creations, but this is not a glorified Food Network special: Gelb also weaves in a poignant story about the complicated relationships between fathers and sons. Ono, 85, is widely regarded as the greatest sushi chef in the world, and he has trained his two sons, Yoshikazu and Takashi, to follow in his footsteps. Their efforts to earn his approval give the film a surprising emotional force. Slate spoke to Gelb by phone earlier this week about the Ono family, the filming process, and the lifespan of a piece of sushi. Slate: How did you first become interested in Jiro? David Gelb: I owe a lot to my parents for taking me to Japan when I was little. That kind of built my love of Japanese culture ever since I was a little kid. I loved the giant robots, and I loved the food—cucumber rolls especially. Slate: How often did you go? Gelb: I went to Japan when I was two and again when I was four and then again when I was nine, and then a few more times after that. Every few years or so my dad might have a business trip to Japan that might happen over the summer or some time I’d be able to take off school and go with him. And my dad has also always been in the arts. He produced films about classical musicians, and then later he was at Sony Classical, the record label, and now he’s the general manager of the Metropolitan Opera. So that’s where I heard a lot of the classical music, and I think the classical feeling of the movie comes from a lot of the art stuff that my father used to show me. Slate: Philip Glass compositions made up a big part of your soundtrack. Are you just a huge Philip Glass fan, or did you choose his music because you thought it would be appropriate for the film? Gelb: Well, yes, I’m a huge Philip Glass fan, and I think that the answer at the time would have been, “It just feels right.” You see these slow-motion beautiful images of Tokyo or of the chefs working so hard, and you hear this music—it feels right. In hindsight, I think it works because Philip Glass’s music is kind of a metaphor for Jiro’s work ethic, because it’s repetitive but it also builds on itself and escalates, and it’s the same with Jiro’s work. Because every day he’s going, he’s doing the same routine, and trying to do everything exactly the same, but just reaching for that one step of improvement, and I feel like the music’s doing the same thing, so they match perfectly. Slate: You just brought up using slo-mo images. And it seems like you played a lot with speed; you also had a montage where you sped up what the workers were doing over the course of a few hours. Gelb: I love slow motion and fast motion because of what it does to the audience’s perspective. With fast motion, you can show the vast amount of work that is being done. But then when you use slow motion, you can show what happens in just an instant, just the movement of a master’s hands; we might miss that as an audience, but to him, Jiro’s perspective is that every movement is so perfectly calculated, and so with slow motion you can see the nuance of that. And so when you combine the two you get the feeling of the vast amount of work that’s being done but also the painstaking care that goes into every single motion. Slate: I loved the repeated image of Jiro putting a piece of sushi on a plate. Did you give him any direction with that, or is that just the way that he puts sushi on a plate? Gelb: That’s kind of what’s magical about the sushi, is that it looks just perfect every single time. And that’s just how he puts it down. It’s the way that he packs the rice; the shape is perfect, but it’s very lightly packed, so it very gracefully settles into place. With the lenses we were using and kind of getting in very close, you’re really able to get that feeling. If there was an instance where it was just slightly out of focus—because they’re not robots—I would ask them, “Oh, could we put that piece down again?” And they would refuse! Because they would say that the tuna has now changed colors, and it’s no longer at its ideal moment of deliciousness, and they no longer want that piece of sushi filmed. And that’s the level of perfection that we’re dealing with. Even the subtle changes in the color or the way that the oxygen affects the rice after it’s been taken out of the thing for too long—they want everything to be perfect for the camera; they want everything to be perfect for the customer as well. Slate: There’s this contradiction in Jiro’s work between his extreme discipline and asceticism and the fact that what he’s creating is meant to be pleasurable. Did you want to play with that contradiction in the film? Gelb: Oh, sure. I think all interesting characters have a duality to them. We open the film, and you see him standing behind the sushi bar, and he’s incredibly stoic and austere. But after he finishes his work and he’s able to take his uniform off and everyone’s gone home, he relaxes, and it’s almost as if he’s a different person. That’s the duality of Jiro: He’ll crack a bunch of jokes after the service is done, but not during the meal. Slate: The way that he talked about his sons and to his sons seemed incredibly stern. Did you see affection there? Because he came across to me as a really tough dad; is that a fair impression? Gelb: Yeah, I think so. But he kind of jokes about how tough he was. He talks about when his kids were very young, he would leave the house at five in the morning, and then he would get home after ten PM. And one day when Jiro was sleeping in on a Sunday, his younger son saw him in the bed and screamed, “Mom, there’s a stranger sleeping in the house!” because his son didn’t even recognize him. So yeah, he’s a very serious dad, but at the same time he was telling that story, his son was there off-camera, and he was smiling and they were kind of laughing about it. Slate: Were you thinking at all about the stereotypes of Japanese culture when you were filming, and did you ever feel uncomfortable as a white American making this film? Gelb: No, not really. I knew that if I had used exclusively Japanese movement and edited it in a certain way, it definitely could have become a stereotype. But I wasn’t really that concerned with it, because Jiro’s so clear with his vision and what he’s trying to do that there wasn’t too much risk of misinterpretation. And as an American—you know what, at first, it took a little bit of getting used to, mostly for them, for me to be around every day. I circumnavigated that by keeping my presence as unobtrusive as I could. The first couple of days of production, I didn’t even bring my camera with me because I just wanted everyone to get to know me, so they wouldn’t just be staring at the foreigner with the camera the whole time. When you see a foreigner with a camera, everyone gets a little bit suspicious. So I just worked to build a sense of mutual trust with them. And the language barrier was very difficult as well. I had some great translators that I worked with who were incredibly helpful and patient—and Jiro and Yoshikazu were incredibly patient with me as well. And over time, with my broken Japanese and hand gestures, we built a good rapport even without the translator. It required a lot of patience, and it was really a lot of extra work because I didn’t speak the language, but it was totally worth it. Slate: Do you think you’ll ever make movies about food in the future, and if not, what else is in store for you? Gelb: Well, I love eating, and so if I discover another restaurant that inspires me as much as Sukiyabashi Jiro did, I wouldn’t rule out making another movie about food. Right now, however, I’m working on a script which is actually like a murder mystery set in New York City. So I’m thinking of something completely different, and I’m going to apply everything I learned from Jiro to something on the opposite end of the spectrum of cinema. I want to try a new challenge. But when I find that restaurant that really drives me crazy, and I just have to be there every day, I’ll pursue that as well.